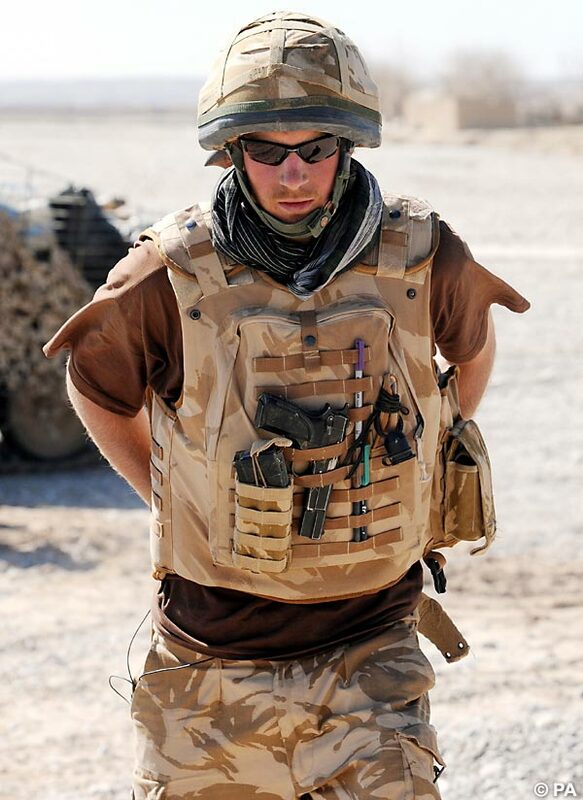 Whatever your views on Prince Harry and his exploits in Afghanistan, one thing that can be agreed upon is that it has been a journalistic travesty. Not that the media signed up to the MoD's secrecy plan in the first place, as once all the tabloids were agreed, the rest of the press and the BBC could hardly break ranks, such would have been the outrage that would have dropped on their heads. That was probably the right decision in the circumstances, but the failure of everyone else across the planet to find out until they discovered that an Australian supermarket trashy tabloid had printed it back in the early days of January, and then the pathetic soft-pedal given to Harry and the Ministry of Defence was anything but a triumph. It seems then if you want the latest gossip, you shouldn't head to the loathsome Matt Drudge, who spent his time during the Clinton years digging up every false scandal ever to emerge, or to Guido, who despite his numerous contacts in the media that knew about Harry's posting didn't get as much as a sniff about it, but to New Idea instead. Where it got the story from is anyone's guess, but back on January the 7th it revealed that Harry had gone with his regiment on a covert mission to Afghanistan, where he had already seen action. Apparently it didn't have a clue about the embargo in this country, but it must surely be the scoop of the year; and no one batted an eyelid. Indigo Red goes even further back, and finds discussion in first the Canadian press that he was training in the country for deployment, then articles in *shock* the UK press doing much the same, which might well have triggered the embargo, deal, or whatever it was. There might well have been D-Notices involved for those who thought of daring to go it alone, even though they too are just instructions, not guidelines that must be followed. If that wasn't humiliating enough for the most tenacious press in the world™, then anyone with the slightest interest in hearing something other than the MoD's no doubt weeks in the polishing releases and the most pathetic questioning, or rather unquestioning of any soldier ever would have been left feeling short-changed. There wasn't so much as a word about Afghanistan itself, how badly the mission is in actuality going, or whether the other soldiers are enjoying it as much as Harry so evidently was, despite the nonsense that he was an ordinary soldier quite clearly being molly-cuddled with one of the safest jobs in the entire country, but there were instead plenty of wonderful photographs and staged videos for the press to savour. Watch as royal family member fires bloody big gun at nothing in particular! Marvel as he talks about targeting Terry Taliban! Laugh as he fails to ride motorbike dumped in the middle of nowhere! When the death of his mother led to the biggest reverse ferret in press history, a woman they had previously dismissed and ridiculed day after day suddenly becoming the people's princess, you would have placed money on that being the biggest volt-face to ever happen. How typical that one of her own has broken that record! Gone is the boozing and carousing prince, getting sozzled on our money, a disgrace to the country referred to at least twice by the Sun as "dirty", and now here's Harry the Hero, the Sun's poster of the soldier prince going up across the country, while it solemnly intones that he's found his vocation and that everything must be sacrificed to ensure he can continue doing the job he so obviously loves. You would of course expect that from the "popular" press, but even the broads fell into line. The Guardian, which itself devoted two pages yesterday to Harry's colonial exploits, outlines how the Times and Telegraph gave his mission seven and five pages respectively. Only the Independent dared to spoil the party by giving over a parsimonious single page to the secret hero. Even that coverage was sycophantic in the extreme, relating how Harry had retrained as a "forward air controller", reiterating how he was sitting in front of "Kill TV" or "Taliban TV" directing American F15 jets to their targets. None of them ever felt the need to question whether this is the best way to fight the war, or that human rights organisations estimate that over 230 civilians were killed in air strikes in Afghanistan in 2006, leading Hamid Karzai to plead in tears for the coalition forces to stop being so cavalier with the lives of those on ground. That might have been unpatriotic, or been construed as suggesting that Harry had killed civilians while blasting the 30 Taliban the Sun claimed he had eviscerated. They didn't point out when Harry said this was about "as normal as I'm ever going to get" that there is nothing ordinary about making life or death decisions through a computer monitor. We viciously attack suicide bombers or other terrorists for their cowardly nature, and are often right, but there is very little difference between that and the end result of dropping 500lb bombs from however many feet in the air onto houses which may or may not be full of Terry Taliban, directed from somewhere far removed via a screen. Even more startling was Harry's remark in one of the interviews that "he doesn't like England much", which in any other circumstances involving anyone else would have resulted in a quick media crucifixion for impugning on the name of the country the same press outlets often bemoan, but this was from the newly crowned hero we can all salute and be proud of. The less said about the craven BBC's coverage, voiced by that "bloody awful man" Nicholas Witchell in the most reverent of tones usually reserved for a state funeral the better. The question has to be just how much was spent on this whole ridiculous fandango. How many man hours at the MoD went into working just how to get him in and then out if necessary in such absolute secrecy? Which PR firm did the sterling job of collating all the propaganda to be screened and printed on his return, or was that the MoD's work as well, involving the Press Association? Just how many individuals had to be directly bribed or bought off in some other way to keep silent? Was he really at any point in any sort of danger whatsoever, because it certainly doesn't look like it at first glance? Is this all to please the prince who threatened to leave the army after he wasn't sent to Iraq, or was it a stunt the MoD went along with because it instantly recognised its value in the propaganda war? We should be fair to Harry. Unlike our leaders and their families on both sides of the Atlantic, at least he's been potentially prepared to make the ultimate sacrifice for his country. If anything, he's the most senior figure from a family in sort of power to go to the front line in either Iraq or Afghanistan, and for that alone he deserves respect. All of this could however have been done without any sort of the pandemonium that prevented him from going to Iraq and then ended his stay in Afghanistan. Looking at the photographs of him in his full kit, body armour and helmet, no one would have the slightest clue that he was the third in line to the throne unless they were personally told. This was always the idiocy of announcing in the first place that he was going to be deployed: the MoD should have just sent him, told no one and not bothered with any deals with the media. They should have treated him like his comrades do: as an ordinary soldier, as that is after all what he is. It's to give too much credit to both the Taliban and the insurgents in Iraq to say that as soon as he was sent out they'd be searching for him because of the value of taking his life. If the Taliban had killed him during this trip, they wouldn't have known any better until the MoD themselves had admitted so. It's just as daft reporting today that extremists are already after him, about the only person they could find to denounce him being Anjem Choudary, the moron from al-Muhajiroun. The Scum babbles about threats being made against him by al-Qaida, with a message on "the terror group's website" about it. They must have set up their own page especially for the occasion, as al-Qaida has never had anything even approaching an "official" website since alneda.com was shut down in 2002. You could put all of this down to "churnalism" or Flat Earth News, ninja turtle syndrome or otherwise, but that might be actually giving the coverage over the last few days some sort of label, explanation or excuse that it truly doesn't warrant. The exploits of one very important soldier have probably been given more exposure that the rest of the army's achievements and complaints have in the last couple of years. Soldier going to war/coming back from war isn't a story, unless they've come back in a body bag. The MoD might be celebrating a wonderful success in PR terms, but somehow you get the feeling that the unfortunates on the ground themselves, with another British soldier dying today in Iraq for no reason or point whatsoever, will not be thanking Harry for obscuring the futility of their current deployments. The grim calculus of death. Political correctness goes back to school. The BBFC murders Murder Set Pieces. Soldier goes to war shock caption competition! How to lose the war on drugs. It couldn't be snobbery, could it?